Monday - Thursday: 8 a.m. - 5:30 p.m. Friday: 8 a.m. - 1:30 p.m. If you happen to look up at the right time or right place while at Denver Health, you might find a solid piece of comfort. Beautifully painted rocks are being left for people walking to and from doctors appointments. The person who leaves them there is a woman who walks that very same path. For more than four years, Denver Health patient Margie Garcia has been battling a rare, autoimmune disease called cryoglobulinemia. The disease can attack her own organs, including her brain. 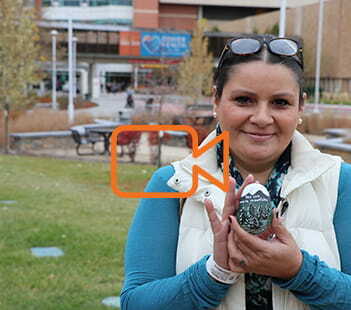 Watch Margie Garcia paint and leave rocks for other patients in this 9News story. The disease is not curable, and her treatment and anxiety are harsh. She wanted something other than a pill to help her. Denver Health Oncologist Sonia Okuyama Sasaki, M.D., said, "in the past, Margie was in the hospital once a month at least, sometimes in the Intensive Care Unit." But thanks to the chemotherapy and care she's been getting at Denver Health, "We've been able to keep her out of the hospital for at least a year at a time." One day, while on her way to a doctor's appointment, she found a rock painted by someone else and realized that if she created one of her own, she could help herself as well as others. So while in the waiting room before one of her infusion treatments, she picked up a rock and started doodling. She found that it took her mind off of the treatments, and she continued to paint while at home recovering. "It started off with basic little stick figures," Garcia said modestly, "I'm not an artist." Garcia now drops off at least 15 rocks every time she comes to Denver Health for treatment. Most are in plain sight, but you have to stop and look for them. She even has a Facebook page called "Margie's Rocks," where she shares her art and connects with other "rock pals" from around the world who do the same thing. Just a few of "Margie's Rocks"
Garcia said she just wanted others to share kindness and positivity and give others hope and inspiration.